Enhance your workflow. 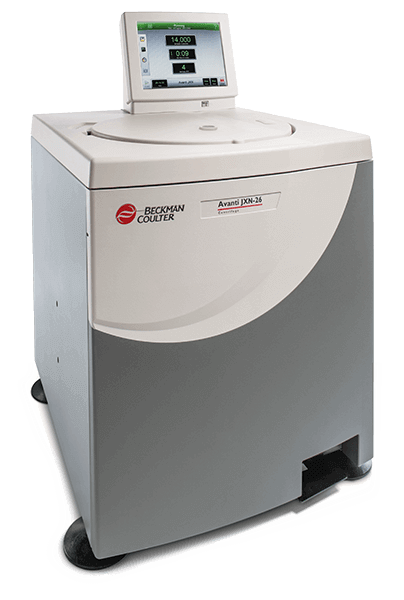 Experience simplified high-throughput sample processing and more control with the JXN-26 three-phase centrifuge with powerful high speed features, low heat output, imbalance tolerance and quiet performance. Three-phase filtration divides materials into solids, liquids and gases. Has a maximum capacity of 6.0L and RPM of 26,000 (82,000 x g). The Friction Reduction System (FRS) means the machine runs quicker, quieter and cooler, with shorter cycle times with high-torque because of the exclusive Switched Reluctance (SR) drive. Stores up-to 1000 user-defined programs.